Until recently, it’s been a dimly lit road back to the possibility of walking for people who have suffered spinal cord injuries. But that is changing and employers could soon benefit. 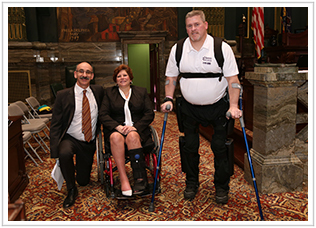 I invited doctors recently from Einstein Health’s Moss Rehab to show fellow lawmakers what the Re-Walk exoskeleton can do for people, and we received a warm and enthusiastic reception. Besides getting people back to work, Re-Walk has given me hope that I will one day be able to walk with its help. I believe it will also help members of our military who have been relegated to a wheelchair after suffering paralysis in battle. Our story was picked up by the Harrisburg Patriot-News and you can read more about this wonderful technology in my press release. Pennsylvania’s labor unions have been on the pointy end of many a Republican stick, and the latest proposal by Rep. Garth Everett is another example. 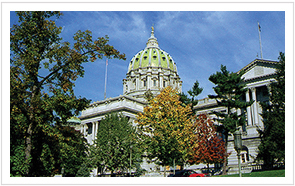 The Lycoming County Republican has proposed a bill that would make the General Assembly the final arbiter in contracts negotiated by unions of commonwealth employees and the governor. Lawmakers could say no to whatever they choose. It’s a bad idea and goes against our well-established system of checks and balances. Watchdog.com reports that Rep. Everett has told it his legislation, if adopted, would only be used in rare circumstances. I think it will open the door to anti-union public officials who want to say no to any labor group just because. United Food & Commercial Workers President Wendell Young is against the proposal: “‘(He) lives in some kind of fairy-land world’ to suggest such legislative oversight over only labor deals,” Watchdog reported Everett as saying. Pennsylvania isn’t the only state battling anti-union sentiment. Here’s a good story, courtesy of a student-run newspaper serving Notre Dame and Saint Mary’s College, about an Indiana state lawmaker who is up against similar ideological walls. Is Slave Labor Shrimp Being Served in American Restaurants? No new bills have been introduced to the committee. However, Sen. Lisa Baker proposed an “unemployment compensation fix” amendment to House Bill 319. Currently, UC is set at 49.5 percent. Baker’s amendment would lower that percentage (outside of the high quarter) to 42 percent. If passed by the House and the Senate, this “fix” would give 33,000 seasonal workers, who would normally be denied benefits, unemployment benefits.